I have often wondered why my cockatiel always looks so clean and smells so good, unlike our pet dog who is the complete opposite. Feathers are a big job, and if you look at birds in the wild they spend hours preening themselves to maintain their feathers. In fact, much of their day is spent pruning their feathers. They literally comb their feather with their beaks, so that each strand on the feather lies flat. While doing this they also remove lice and other parasites from their bodies. Most birds have oil-secreting glands at the base of their tails, and with their beaks, the oil gets spread all over their bodies. This oil keeps their feathers in good condition and also waterproofs them. 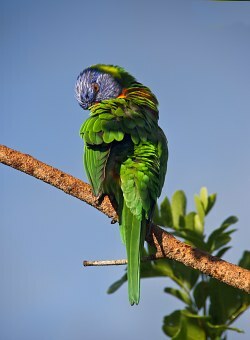 Other types of birds, like a lot of the parrot family, rely on dust to keep their plumage clean. This dust is called powder down and is produced naturally by the feathers. When birds saturate of bathe themselves in water or cover themselves in dust, they are actively maintaining their plumage. Birds of all types will enjoy splashing around in a bath for a few minutes. A wild bird will normally go and perch in a sunny spot and fluff its feathers to dry afterward. So now you know why you have a clean cockatiel most of the time. My cockatiels, budgies, and parrots all love to be sprayed on a hot day. I take a bottle much like the ones on the left, adjust it to its finest spray and let the mist fall over the birds. Use a small plant sprayer bottle with a fine nozzle, which will create a mist of water droplets. Fill the bottle with tepid water and be sure to move the seed out of the cage before starting to spray or it may become wet and moldy. From the outset, you should accustom your bird to being sprayed. At first, he will be nervous, but he will quickly learn to enjoy a regular spray bath. Wait until your cockatiel is perched quietly, then press the trigger several times aiming it just above the cockatiels head. In this way, it will feel like a shower rather than an onslaught of water. Once your little parrot gets used to this, he will solicit a spray by lifting his wings, fluffing himself out or calling loudly. Apart from washing their plumage, the water will also dampen down feather dust, which may otherwise be wafted into the air and can cause discomfort, especially to asthma sufferers. Cockatiels will produce more feather dust during a molt, so regular spraying at this stage can be useful. When giving your cockatiel a spray bath, there is no need to drench him. A light covering of water droplets will be sufficient, or your bird might catch a chill. There also isn’t any need to dry the clean cockatiel after spraying, and if you do this early on a warm day he will dry out naturally and you now have a clean cockatiel again. Cockatiels normally enjoy splashing around in a bath, but make sure they are not placed in a draft when bathing. Click the pictures to find out more information about these baths. There are all different types of bird baths available online, even ones with mirrors at the bottom to entice a reluctant cockatiel. Helps to provide relief from feather picking and scratching and minimizes molting. Cleans, beautifies and invigorates feathers and skin. For use on all caged birds. Miracle Care Feather-Glo Bird Bath Spray is fatty acid-based which provides a soothing refreshing moisture to the skin under the bird’s feathers and helps to keep natural oil glands open. 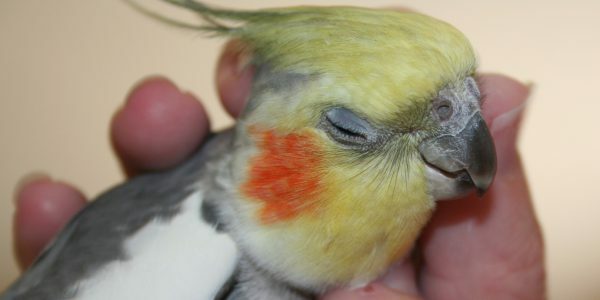 “My cockatiel was continually picking at his feathers. His molting was heavier than in any past years and he looked pretty ratty. We could not see evidence of any mite/insect infestation. I began spraying him with Feather Glo daily for the first few days. Almost overnight we noticed an incredible improvement. His feathers became smooth, he stopped preening and picking at himself continually and was much more relaxed. After the first 4-5 days I spaced spraying to a couple of times a week. He continues to look great! When giving your cockatiel cage its weekly clean, make life easier for yourself by placing it in the shower, minus your cockatiel and its food. Run the hot water over it, and then give it a gentle scrub to remove any hard food stuck on the bars of the cage. Some steel wool or an old toothbrush should work well for this purpose. Once the cage is clean, spray on some disinfectant that is available at your pet shop. Make sure that it is bird safe and follow the directions on the bottle. Rinse again and let the cage dry thoroughly before replacing the food and your cockatiel. To dry wooden perches off quickly, place them in the warming drawer of your oven. Let them cool before placing them in the cage. Poop-off is another great must have product to make cage cleaning easier. Removes droppings from all types of avian diets including Seed fruit nuts meat vegetables nectar bugs grains formulated diet and greens. Removes even the toughest stains from clothing upholstery and carpets. “I adopted a conure recently and the cage she came with was filthy! The white bars of the cage was covered in feces and food. The bars were so caked that it looked yellow. I took the cage into the bathtub and sprayed it down with Poop off and let sit for ten minutes. Next, rinsed the cage with hot water and it immediately looked brand new. So now you know the answers as to why in general you always have a clean cockatiel. Thanks for that info. I was wondering why I always had such a clean cockatiel, and I never see him bathing. Hi. That was a very interesting article to read full of useful tips and information. The content is well written and easy to follow. Who knew that’s why they clean themselves so much? I was wondering how often you need to spray the cockatiel? How do you make sure the cockatiel stays warm after spraying it? There are no rules as to how often you need to spray your birds, as they keep themselves clean. I just do it because they love it. I don’t do it in winter however. When I do spray them I do it when the weather is warm and in the morning, so they have the rest of the day to dry out properly. Just make sure that there is no draught on them when you do it. If it is really cold you can, but just keep an eye on your cockatiel. He will let you know if he is getting too hot by panting or moving to the other end of the cage. Are those bird baths also good for canaries or do you recommend something else? Thanks in advance. Canaries like parrots do preen themselves, and so should stay quite clean on their own. I find my white cockatiel always seem to have a dirty tail though, but she does love splashing around in her bath which helps. Maybe provide a small bird bath for them to try. I wouldn’t buy the same one that a cockatiel uses, as they are much smaller, so maybe a budgie sized one for them. Don’t own a cockatiel, but a budgie, but I’m guessing that would still be the same advice, right? Those products you mentioned seem interesting. Are they all natural though? And also, maybe you have an idea on how to clean bird poop off wooden railings? We have wild birds coming to feed on our deck and they leave their “thanks” quite often. Yes I also have budgies, and they are almost like small cockatiels. Poop off is an excellent product, but not all natural ingredients. However the ingredients used are safe for animals. Unfortunately we can’t get this product in South Africa, so I get my family to bring me some whenever they come over. It does go a long way and lasts a long time.